whose rider is called Faithful and True. The second ride will be greater than the first ride. His first ride as king was in humility and humanity on a young donkey fulfilling the prophetic word if Zechariah 9:9, “Say to the Daughter of Zion, See, your king comes to you, gentle and riding on a donkey, on a colt, the foal of a donkey.” Jesus was riding to an appointment with the cross. He rode as a man, a carpenter, a teacher, a very human king to many of those shouting ‘Hosanna’. That was His first ride, but just as the latter reign is greater than the former reign, so will the second ride be greater and more glorious than the first. 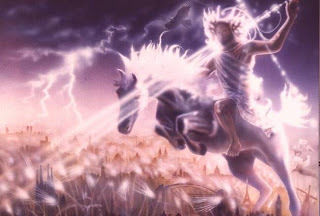 I saw heaven standing open and there before me was a white horse, whose rider is called Faithful and True. With justice He judges and makes war. His eyes are like blazing fire, and on His head are many crowns. His has a name written on Him that no one knows but He Himself. He is dressed in a robe dipped in blood, and His name is the Word of God. The armies of heaven were following Him, riding on white horses and dressed in fine linen, white and clean. Out of His mouth comes a sharp sword with which to strike down the nations. He will rule them with an iron scepter. He treads the winepress of the fury of the wrath of God Almighty. On His robe and on His thigh He has this name written: KING OF KINGS AND LORD OF LORDS. As we approach celebration of another Resurrection Day, there is excitement in my spirit that we approach a step closer to the time for Jesus’ second ride. But this ride will be more glorious than the first. He will be on a white horse, a grand steed. This ride will be as a warrior, a king, a ruler and as LORD of Lords. He will wield a sword. Instead of a crown of thorns he will wear crowns of righteousness. What a day that will be! Get ready. . . He’s coming!! !